Once you have selected categories, you will see a window similar to the below appear. This will allow managing categories. In here, you can add in, edit or delete categories. You can also create your sub menus by simply selecting a category and clicking add! By the way, you may also use right click shortcuts in the left box to edit, delete a selected category, and add sub-categories to any category. Move a category by selecting and dragging it to the target parent category on the left. To disassociate one category with another, click and drag it back to the root position. Here you will find an image for the view on the website for the categories if they were arranged as seen in the example image above. 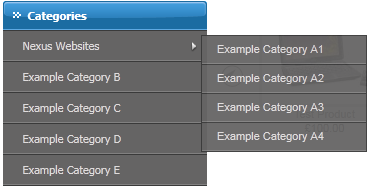 If the sort order field is left blank, then the categories will be arranged alphabetically. 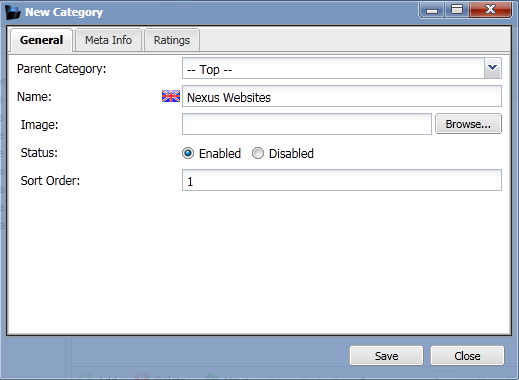 Image: To include an image displaying on sub categories (see next page for details). Sort Order: What order you want the category to display in (for example 1 would come before 5). You can assign products to more than one category! From a customer’s point of view, it makes navigation easier and certainly looks far better! If the category has products within it, you should be careful to delete the category because both the category and all the products assigned to it will be deleted. For products that are assigned to this ONE category only, deleting this category means deleting the products together. For those to more than this category then the products will remain.